A new refrigerator is a major purchase. You have options ranging from budget-friendly with no-frills all the way up to the latest models with all the bells and whistles. You can even get a refrigerator that uses Wi-Fi to keep up with your grocery list and let you know when you’re running low on something. You can spend hours online reading product reviews, manufacturer’s advertisements, and all the while, trying to decide which is best for your home. However, sometimes you don’t have time to do all that research. Any number of situations could leave you with a need to buy a new fridge quickly. 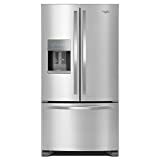 Refrigerators, especially older ones, break down and get damaged. If you change your residence, you may have to leave your old appliance behind, or your old unit may not fit in your new space. This guide can help you narrow down your search to the models that best meet your needs. For most families, a new refrigerator is something they’ll keep for many years. You don’t want to spend a lot of money on something you’re not happy with, and it’s not easy to return it. Whirlpool Gold refrigerators were favorites for several years. While they are no longer available, check out our buyers’ guide to learn about some alternatives that can bring you the same quality and features. Whirlpool Gold refrigerators came in two models, a 25 cu. ft. model and a 26 cu. ft. model, both with French doors. They had many features in common, like an adaptive, defrost cycle, energy saving technology, and a temperature management system. Efficient icemakers, bins in the doors, and sleek external appearances made these appliances a pleasure to own. Adjustable glass shelves allowed for easy organization. For all the similarities between the two models, a few differences made it easier to choose between them. The 26 cu. ft. model had a convertible compartment for meat and vegetables, as well as a dispenser lock on the filtered ice and water in the door to prevent messes. Humidity controlled drawers kept food fresher longer, LED lighting brightly lit the interior, and an alarm alerted the homeowners if the door was left open. The 25 cu. ft. model had a can caddy for storing beverages. Unlike the larger Gold model, this one had a freezer at the bottom of the unit with a separate lighted drawer. Full width shelves allowed for storage of wide items like cakes and platters. Two half width drawers with climate controls and one and a half without provided plenty of space. A hanging deli drawer and five interior shelves, as well as crispers, kept food fresh to prevent waste. This model used incandescent lighting as opposed to LEDs. Unfortunately, all good things must come to an end, and the Whirlpool Gold refrigerators are no longer available for purchase. This buying guide presents some 2018 alternatives for you to consider. You can still get the features your family needs while enjoying newly available features as well. What should you consider when you’re choosing a new refrigerator? Many factors affect how well the appliance will fit into your home and your life. Think through these things before you make your purchase. 1. How do I measure for my new refrigerator? You want to measure the width, height, and depth of the place where your refrigerator will sit. Don’t forget, however, to add a few inches all the way around so that air can circulate around the unit. Also, remember to measure how much room the doors need to swing all the way open. Take note of which direction the doors open so that you if you need to, you can have the doors reversed before the unit is delivered to your home. Finally, if you’re considering a model that sits flush with your countertops instead of sticking out past them, you’ll be giving up food storage space by choosing that option. 2. What are your family’s eating and cooking habits? 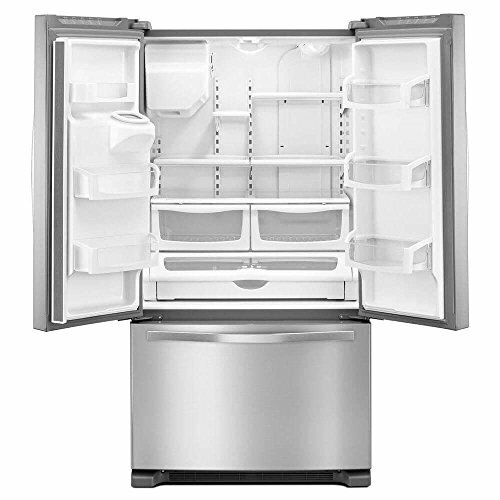 If you cook regularly and you use a lot of fresh produce, you might want a unit with the freezer on the bottom. It’s easier to reach refrigerated items in these models. On the other hand, if you’re a microwave-dependent household, you might prefer having the freezer on top so that you can grab your frozen goods quickly. Side-by-side refrigerators combine the good in both styles, but wide items like pizza boxes may not fit easily. Most have adjustable shelving and variable temperature settings for the drawers to help you work around this. 3. Who lives in your home and how do they use the refrigerator? If you have small children or anyone in your home who has difficulty reaching high spaces, a side-by-side unit may be the best for you. It puts refrigerated and frozen items within easy access. Do you have someone in your house who likes to browse, standing in front of your fridge for several minutes with the door open while they figure out what they want? If so, the side-by-side and French door models don’t release as much cold air, so they save energy and keep food fresher longer. 4. What can your budget handle? The least expensive and most basic models are traditional freezer-on-top units. They have very few extra features. The exterior finish will significantly affect the price, with stainless steel, multiple colors, and fingerprint resistance options that will drive up the cost. Leaving off the built-in ice and water in the door is another way to save money on the cost of the machine and the energy it uses. Consumers report that these features break down often anyway, so you can save yourself the hassle if those aren’t critical to you. If you have a little more to spend, you can pick up some new conveniences like internet connections, sparkling water makers, four doors, and compartments that can change from freezer to refrigerator and back again. 5. How will the new refrigerator affect your utility bills? The fridge uses on average of up to 14 percent of the energy used in your home. Pay attention to the Energy Guide label. To save money on your utilities, consider leaving off water and ice makers because they can add as much as 20 percent to your bill. Refrigerators with a top-mounted freezer units use from 10 to 25 percent less electricity than other models. A model with an Energy Star mark uses at least 20 percent less electricity than those without. 6. How often do you clean your refrigerator? Stainless steel smudges easily, so it needs to be wiped down often. Instead, you can choose a faux-finish for the same look with less cleaning. Glass shelves with spill-resistant lips are easier to keep clean as well. For such a significant purchase, you need a complete picture of what you’re buying. In order to give you the most comprehensive picture of these refrigerators, we took into account not only the manufacturer’s information but also reviews from consumers who own the machines. We even researched how professionals in the field rate the machines on reliability, ease of repair, and cost of ownership. With all of this data incorporated into the guide, we’ve given you an unbiased look at the Whirlpool Gold refrigerators. The Whirlpool refrigerators we used for this review range from $1,699 to over $2,500 depending on the exterior color and optional features you choose. Basic black and white finishes are generally the least expensive. Stainless steel or bronze finishing and fingerprint resistance surfaces raise the cost significantly, adding up to $200 to the price. Ice and water in the door, full width shelving, and extra drawers or compartments drive up the cost as well. Whirlpool offers five 2018 models that are comparable to the Gold line of appliances. A few new features have been added as well. All of these are available at most major retailers who carry Whirlpool refrigerators. This unit is a basic model that’s a good choice if you’re on a tight budget. The ice in the door saves you freezer space, and the Accu-Chill temperature management system uses internal sensors to run the compressor only when needed. Exterior filtered water can reduce or eliminate the need to buy bottled water by giving you fresh, clean ice and drinking water. Tap Touch controls lets you access your favorite features quickly. Adjustable gallon door bins give you flexibility in storage. On the exterior, the hinges are hidden for a streamlined appearance. It lacks some of the more modern bells and whistles, like a night light, LED lighting, and spill proof shelving. Also, this unit is not Energy Star rated, so it’s less efficient than other models. As a basic model, it starts at $2,400 - $2,500 and goes up depending on exterior finish and optional features. This is another basic appliance. It has all the features of the first unit, but it adds a night light and an Energy Star Qualification. It lacks LED lighting, which is more efficient, and the exterior is not as streamlined as the higher end models. As a basic model, it starts at $1,699 and goes up depending on exterior finish and optional features. In addition to all of the features of the first two appliances, this unit adds frameless glass shelving for greater flexibility in storage options. It also has LED interior lighting which is superior in performance to traditional incandescent bulbs. Air filters keep your ice and water as fresh as possible, and the hidden exterior hinges improve the appearance. At this level, you don’t get the exterior temperature controls or the humidity-controlled crispers. As a mid-range model, it starts at $1,900 - $2,000 and goes up depending on exterior finish and optional features. In addition to the features of the first three models, this unit steps up to add an exterior refrigerated drawer for easy access to your family’s favorite items. The exterior features a surface that is resistant to fingerprinting for less cleaning. A measured, fill feature lets you put precise amounts of water into a pitcher or measuring cup. This model is Energy Star Certified, a higher rating than the Energy Star Qualified. This product is made in the USA. Spillproof glass shelves reduce messes, and exterior temperature controls make it easy to adjust the shelves. You also get humidity-controlled crispers to keep your produce fresh longer. This is a high-end option that includes all except the finest details. As a mid-range model, it starts at $1,650 - $1,800 and goes up depending on exterior finish and optional features. With all of the features of the first four models, this one adds a triple crisper and MicroEdge shelving to contain leaks. A temperature-controlled pantry runs the full-width of the machine, and a freezer divider helps you keep everything organized. This unit is Energy Star Qualified rather than Certified. The fast-ice option lets you lower the temperature to produce ice faster when you need it. Filtration is advanced to the next level with a FreshFlow Produce Preservation unit and a PUR water filtration system. There’s even a pizza pocket and a fold-away shelf to accommodate tall items like wine and soda bottles. At the highest price point, the 25 cu. 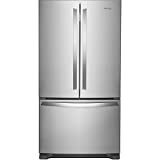 ft. Whirlpool French Door Refrigerator with MicroEdge Shelves has the most features. If you’re on a budget, the 26 cu. ft. Side-by-Side Refrigerator with Tap Touch Controls and the 26 cu. ft. Side-by-Side Refrigerator with In-Door-Ice Plus System are both good choices that can meet the day-to-day needs of most families. All of these units get four to five stars in consumer ratings. All things considered, the final decision comes down to how much you want to spend and how many advanced features you’re looking to get. It appears that in Whirlpool refrigerators, you do get what you pay for.